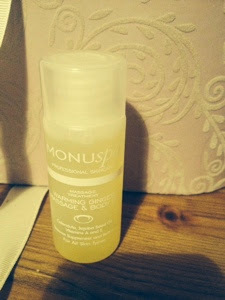 Monu Skincare Warming Ginger Massage & Body Oil. I love massage oils because they are always such a treat and scream out luxury and relaxation. Night one I was the masseur, I think if your giving a massage its important to do it right (not that I have proper training) I mean in terms of setting the right tone. Lights need to be low so your not getting blinded by bright fluorescent! and I like to stick on some 'relaxation songs' on you-tube just to really get the relaxing going. The massage oil itself has a really lovely ginger scent strong but by no means overpowering. You need to rub your palms together in order to warm the oil and you really do feel the oil beginning to warm after a minute or two. I really loved the texture if this makes sense it was oily without being greasy or too slippery. It was perfect to prevent friction whilst massaging. But what I loved most about It was after about 20-30 mins It did dry into the skin meaning that It didn't need to be rubbed or washed off which I have experienced with other oils. This also gave It the added bonus of working as a moisturiser. As a relaxing luxury treatment it gets a thumbs up from my Mr. as his comments were 'that was savage, I slept like a baby'. Ill add here that he does have trouble both relaxing and sleeping so that is one major compliment! Unfortunately for me my turn did not include dimmed lights or relaxing music, rather a comment 'how do i use this stuff?' followed by a quick explanation and away we went. I have to admit it felt amazing going on, my massage was more like someone rubbing on body lotion than actual massage but ill definitely take that and it was still very lovely. The smell when It was on was way more complex than when I had smelled it as the masseur. It made me feel relaxed and cosy and you can definitely feel the 'warming' part of its title. I have to agree with my other half this did help me to sleep like a baby! But more than that I woke up next day with baby soft skin all over my back brilliant bonus! I do feel way less stressed and refreshed after my lovely treat. I definitely look forward to using more Monu products in the future.